Doing that thing we do! Washing large industrial vehicles like gravel and cement trucks. Cleaning house siding, facia, windows. Removing oil stains from driveways and garage floors. Cleaning up dumpster areas - all that garbage and gunk that builds up around them. Helping restaurants keep their property sparkling by cleaning hood and exhausts, drive thru pads, windows, and equipment. 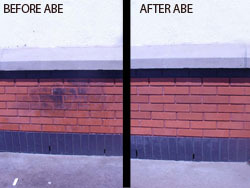 Removal of graffiti from most surfaces. Our hot and cold high powered pressure washer allows us to clean low and high pressure jobs with a range of 1000 to 3000 psi with temperatures up to 300 degrees.